Mariachi is a small musical ensemble that originated in Jalisco, Mexico. Composed mainly of a variety of mostly stringed instruments, it is a mixture of Spanish, native and African traditions, and differs from region to region. Though mariachi has long been considered a uniquely Mexican sound, Carlos Carrasco, the student director of the CSUN Latino Music Ensemble, encourages anyone to join in with their instrument of choice. “The more instruments, the better the song!” he said. Carrasco started playing when he was 5 years old after begging his mom to buy him a guitar he found at a garage sale. He has consistently played the guitar and the vihuela ever since. The CSUN Latino Music Ensemble started nearly 10 years ago as a Latin-fusion-focused group. It changed over time from jazz to cumbia until it landed on mariachi. Students from all backgrounds join the group for many different reasons. 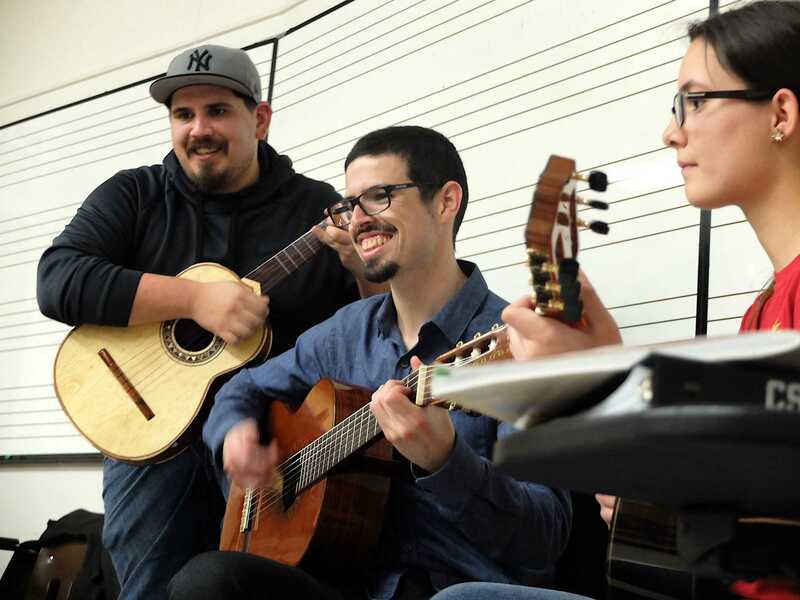 The ensemble, run by Carrasco and Chicano/a Studies Professor Peter Garcia, is a club but they’ve started paperwork to potentially get the university to approve it as an official class. The group consists of 12 musicians with five instruments: violins, trumpets, the guitarrón, guitars and vihuelas. Some groups add harps, and accordions depending on what songs they’re playing. “There is no limit to how many instruments can play,” Carrasco said. The ensemble meets every Wednesday at 3 p.m. at CY 217. Contact Carrasco at carlos.carrasco.94@my.csun.edu for more information.